I have taken been cruising since 1975 and have been on many different lines, but this was my first time on Holland America and was really looking forward to taking a "step up". The itinerary was wonderful and we really enjoyed the cruise from that aspect but the service was sub standard in my opinion. Our stateroom had a leftover champagne bottle and a few other items in the cabinets upon boarding and there was a layer of dust on the ledge behind the bed. Many of the chairs in the common areas were worn out with sprung seat cushions. This was a beautiful scenic cruise except the ship windows were dirty and were never cleaned during the two week cruise. I had dinner in the Pinnacle Grill and upon opening my menu had food fall from the menu into my lap. I have many other complaints but I think this gives you a good idea of why I gave this cruise a 2 star rating. There was generally a line at the customer service desk and the staff there actually got a tiny bit on the nasty side when trying to fend off the complaints - to be fair there were so many that they were probably very tired of handling them. On the plus side, I thought the food was very good and as I said before the itinerary was outstanding. I was also pleased with the entertainers that were brought onboard, the ship&apos;s singers and dancers were fine, typical cruise performers. Embarkation and Debarkation were quick, easy, no waiting around and I really liked how they handled it. The comfort level of inside temperature of the ship varied quite a bit. I was pleasantly surprised to find the dining room a very comfortable temperature and did not need a sweater for my short sleeved outfits. However, in the explorer cafe I had several layers on and still found it chilly. It seems that the outside temperature had a much greater influence on the inside temperature than on other ships I have been on. I was disappointed that it seemed like all the other entertainment revolved around food and drink - mostly drink - and of course all at additional expense. It was interesting to note that travel companions of ours who did attend many of these events got to know the cruise director quite well, he was always at the alcoholic events, but I am not sure I could even identify him since we rarely saw him. I did think it rather odd when we were sitting with our travel companions one day in an area very close to where the Sip & Savor event was to take place. He came over to offer to bring the Sip & Savor fare to them but never offered to bring it to us, indeed he did not even speak to us. I had already booked a second cruise with Holland America in January of 2019, I am sincerely hoping that it will be a different experience, but if not, they will never have my cruise business again. I have taken been cruising since 1975 and have been on many different lines, but this was my first time on Holland America and was really looking forward to taking a "step up". The itinerary was wonderful and we really enjoyed the cruise from that aspect but the service was sub standard in my opinion. Our stateroom had a leftover champagne bottle and a few other items in the cabinets upon boarding and there was a layer of dust on the ledge behind the bed. Many of the chairs in the common areas were worn out with sprung seat cushions. This was a beautiful scenic cruise except the ship windows were dirty and were never cleaned during the two week cruise. 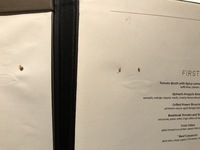 I had dinner in the Pinnacle Grill and upon opening my menu had food fall from the menu into my lap. I have many other complaints but I think this gives you a good idea of why I gave this cruise a 2 star rating. There was generally a line at the customer service desk and the staff there actually got a tiny bit on the nasty side when trying to fend off the complaints - to be fair there were so many that they were probably very tired of handling them. On the plus side, I thought the food was very good and as I said before the itinerary was outstanding. I was also pleased with the entertainers that were brought onboard, the ship&apos;s singers and dancers were fine, typical cruise performers. Embarkation and Debarkation were quick, easy, no waiting around and I really liked how they handled it. The comfort level of inside temperature of the ship varied quite a bit. I was pleasantly surprised to find the dining room a very comfortable temperature and did not need a sweater for my short sleeved outfits. However, in the explorer cafe I had several layers on and still found it chilly. It seems that the outside temperature had a much greater influence on the inside temperature than on other ships I have been on. I was disappointed that it seemed like all the other entertainment revolved around food and drink - mostly drink - and of course all at additional expense. It was interesting to note that travel companions of ours who did attend many of these events got to know the cruise director quite well, he was always at the alcoholic events, but I am not sure I could even identify him since we rarely saw him. I did think it rather odd when we were sitting with our travel companions one day in an area very close to where the Sip & Savor event was to take place. He came over to offer to bring the Sip & Savor fare to them but never offered to bring it to us, indeed he did not even speak to us. I had already booked a second cruise with Holland America in January of 2019, I am sincerely hoping that it will be a different experience, but if not, they will never have my cruise business again. If the cabin had been clean, I would have given it a fairly high rating. I thought the storage space was excellent both in the cabin and in the bathroom. I saw on one site that it was near a self serve launderette, but that is no longer there. Noise level was good, there were a very few occasions when you could hear someone using what sounded like a metal staircase, but rarely and it did not interfere with sleeping at all. I will say that I am not sure the AC was working well, we had it turned all the way down (and I am usually one of those people wearing a sweater in summer due to AC being too cold) and as long as it was not warm outside (Alaska) it was fine but on the few warm days we had, it was getting a bit too warm in the room. We rented bikes from the Downtown Bike Rental and rode the Tony Knowles trail. It is about 22 miles round trip and it was just a bit much for us non regular bike riders. The bike shop is great and VERY helpful, but you might want to consider renting e-bikes if you are not a regular bike rider. That being said, still glad we did it. We were a little disappointed in the Anchorage Museum. It did have some interesting displays but we are really big museum people and were worried we would not have enough time there. It turned out we had plenty of time even after doing the morning bike ride. We went to the Three Sisters Bakery and it was very good, but I would not go out of my way to go there again, we have bakeries that are just as good here at home and I did not think it was all that special. We did take a taxi out to the Bear Creek Winery and loved doing the wine tasting - they do have very unique wines there - and enjoyed walking around the grounds. Didn&apos;t seem like a whole lot else to do in this port if you didn&apos;t take a nature tour of some sort. The Cannery was nice for what it was. It was interesting to see the cannery displays and to look at the merchandise in the shops. We did get fresh crab to eat and it was very good. This port is really only good for a short time and probably would not bother to get off the ship if we go a second time. People were very friendly. We rented a car for the day and had a wonderful time. We went to the Mendenhall Glacier Visitor Center and hiked some of the trails, then stopped at Glacier Gardens which we also really enjoyed - there were great mountain top views there. We went to the Salmon Hatchery which was a quick stop but interesting. We did a self guided tour of the state capital building, dropped off the car and went up the Tramway and hiked a few paths and ended the day at the Red Dog Saloon. We never felt rushed and got to see everything we wanted to see and could only have done so by renting the car and doing it on our own. We enjoyed the Totem Heritage Center. I especially liked going here early in the cruise because I learned to identify many of the totem pole carvings which was fun to use later in the cruise at each port where we saw them. We also liked the Great Alaskan Lumberjack Show. Yes, it is a classic tourist show, but still fun to see. However if you have seen the Lumberjack show in Epcot, it is pretty much the same thing. Town is extremely walkable, no need to take a tour IMHO. We stopped and had coffee at Monk&apos;s Coffee House. Probably some of the best coffee I have ever had. They were really busy so we had to go to an upstairs room for a table. Great view of the city, nice way to spend a slow morning. We did several other things around town and there were interesting things to see but glad we didn&apos;t spend the money for a tour. We took the shuttle into town and walked back to the ship. It was a bit of a walk but very enjoyable. We used to live in the area so most of the usual tourist sites we have seen many times. We had a late flight out on debarkation day, went to the Chihuly Glass Museum and Gardens (VERY worthwhile, just beautiful) and the Museum of Pop Culture which we also enjoyed. We used Uber to both get to the ship from our hotel and from the ship to the museums and to the airport. Easy and way cheaper than using Holland America transfers. After reading pros and cons, we did go to the Fortress of the Bears and were glad we did. We walked the totem trail at the park and saw the Russian Bishops House. That was well worth seeing and the guided ranger tour is a must. Victoria is a beautiful city. We started with high tea at the Empress and though pricy it did not disappoint. Service was impeccable - wish the ship&apos;s service was even half as good. Then we walked to Craigdarroch Castle. It was well worth seeing but there is no AC and it was a hot day for Victoria so we were a bit wilted by the time we finished. We then went to Miniature World. It is outstanding - do not pass this attraction up if you even have a passing interest in miniature dioramas, dollhouses, fantasy stories, circus history, etc. We walked to and from the ship which was a long walk but an easy and enjoyable one.